I tend to be a creature of habit. Like most people, I have rituals that I cling to and these rituals give me comfort. It will likely come as no surprise, but most of my rituals are food related. My morning ritual is COFFEE FIRST. I do not like to eat as soon as I get up but I like, (well actually, it’s more of a need) my coffee. Then once I’m awake, my bran muffin is on deck! I may have a hard-boiled egg or a banana as a snack mid-morning, but I don’t like to change that very much. On the rare day, when I’m out of said bran muffin, egg or banana, I will have a greek yogurt. That is my routine and it serves me well. Thanksgiving is no exception – roasted turkey, stuffing, mashed potatoes, peas, gravy, cranberry sauce and pumpkin pie for dessert – that is the perma menu. But once in a while, I get adventurous and like to mix it up! I have even skipped the morning bran muffin, stopped at Starbucks for a low-fat breakfast sandwich and latte and even forgone my morning snack. Hey, you only live once! 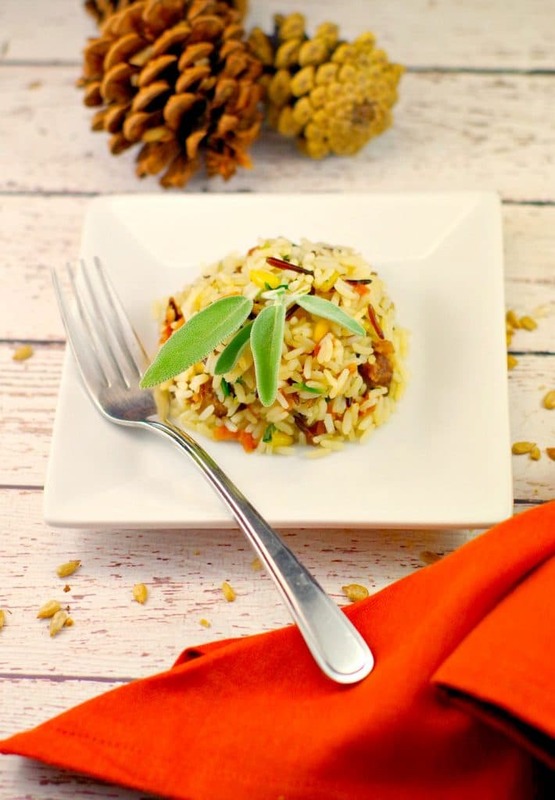 And this rice recipe is the perfect opportunity to do just that – change it up, seize the day and add this recipe to your Thanksgiving menu! It’s gluten-free, only 7 Weight Watchers Freestyle Smart Points per serving, full of fall flavours like apple, sage and pine nuts and makes a wonderful Thanksgiving side or alternative to stuffing. However, mixing it up has not always served me well. I can recall one very bad Thanksgiving dessert decision back in 2008. This rice recipe was born out of a rice pilaf I made to accompany a kabob for a cooking competition that ended up as a finalist in the Calgary Co op Freshipe Cook-off back in 2013. However, the rice was sooo good that I decided to post it on its own. I use dried/dehydrated apples in this dish because they are quicker, there is no peeling, coring or cooking and they give the dish a such a unique texture that really works! My daughter was born in 2007 and by the fall of 2008 I had lost almost all of my baby weight. However, I wanted to stay on track with my weight loss goals. And holidays are always a very challenging time. So, I was making Thanksgiving dinner and thought I’d try to create a low-fat, simple and quick dessert; yet something that was similar to pumpkin pie. Also, I wanted something baby could eat – it was nice and mushy! In the end, I created a parfait out of graham crackers, canned pumpkin, cinnamon, nutmeg and light Cool- whip. All the main ingredients in pumpkin pie that should taste great, you say? But you guessed it- NOPE! Totally did not work – pretty gross AND unsatisfying! The sucky part is, I may as well just had pumpkin pie. In fact, I still wish I had. 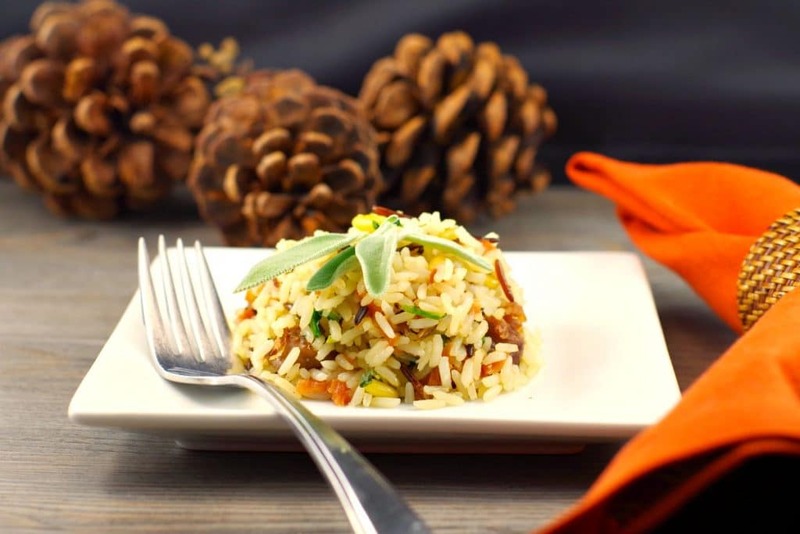 But I can guarantee you that you don’t have to give anything up to add this delicious gluten-free rice dish to your repertoire. So, if you are looking for gluten-free side dishes for Thanksgiving this year, you can welcome this one into the Thanksgiving fold with no regrets! Serving your rice in a shape, as pictured below, gives it a little touch of elegance. If you’re not sure how to do it, then check out this video: How to shape rice for serving *NOTE: This rice isn’t as sticky as your typical rice, so you really have to compress it as you spoon it into the bowl. Then you may also need to run a butter knife around the edges of the bowl to loosen it. Stick to the tried and true Thanksgiving desserts! However, if you are feeling adventurous and looking to mix things up a bit, my Skinny Pumpkin Cheesecake with Oreo Cookie Crust is your answer! You will definitely not regret this decision! 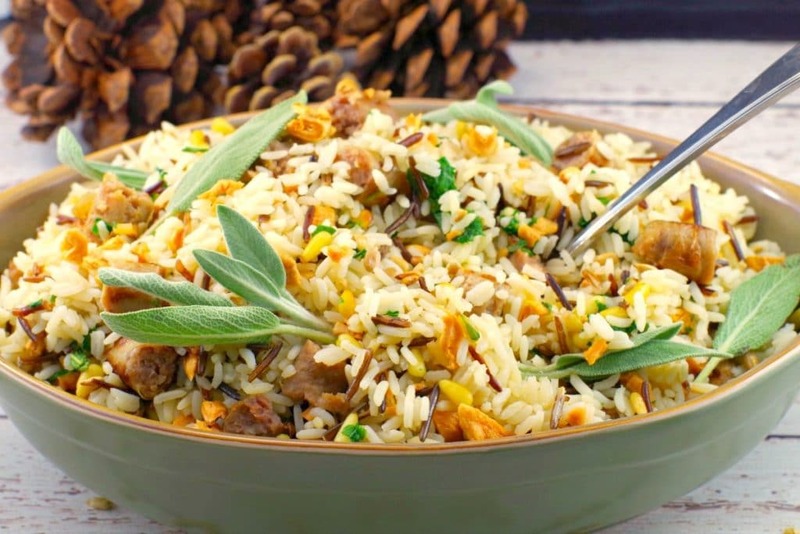 This Gluten-free Sausage & Apple Rice with dehydrated/dried apples, sage, wild rice, spinach and pine nuts is a great fall dish and perfect for a Thanksgiving or holiday side dish @ 7 Weight Watchers Freestyle Smart Points per serving! 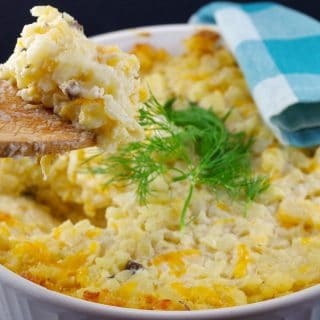 Make the rice: Cook rice according to package directions, but use chicken stock or vegetable stock in place of water. Cook sausage in a frying pan on stove top over medium heat until no longer pink and set aside. Heat a frying pan on medium high heat. Add 1 tsp of olive oil and the pine nuts. Toast, for a minute or so, stirring, then add sage and spinach. Continue to stir until spinach is soft and pine nuts are fragrant. Remove the mixture and stir into rice. This looks so good! Love the apples you’ve added into this! 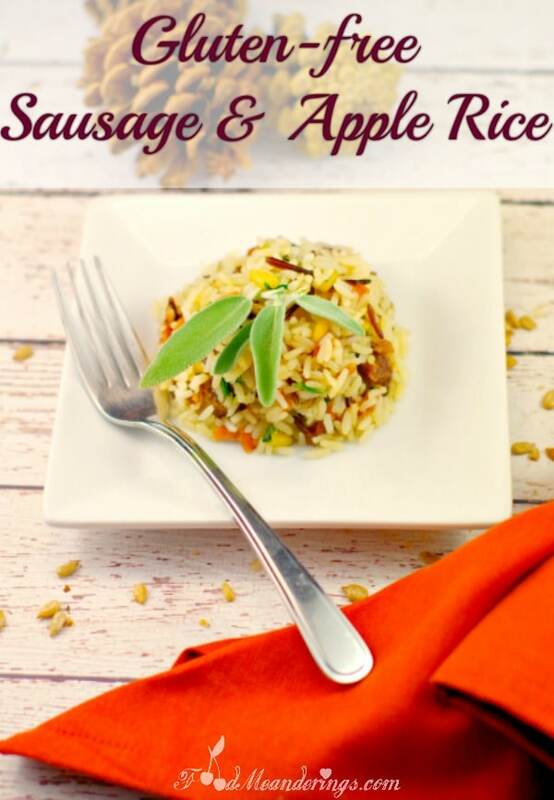 I love changing things up and this rice looks delicious with sausage and apples. Yum!